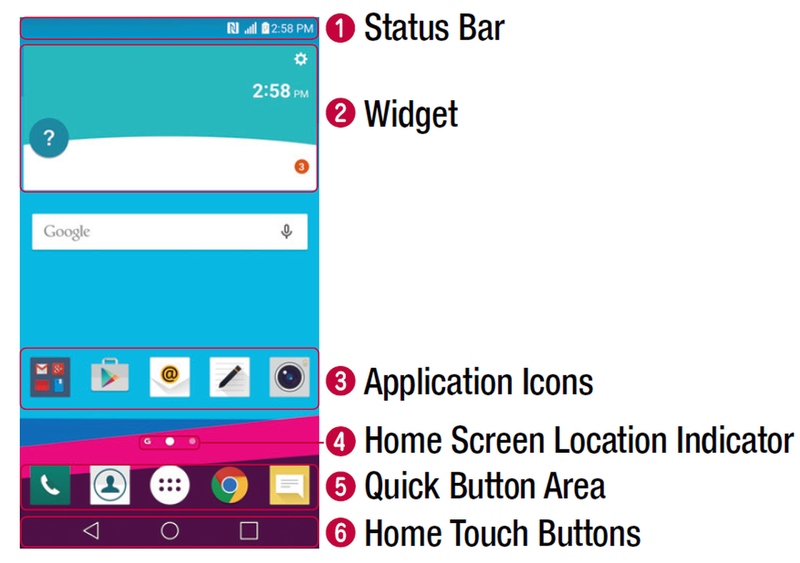 LG G5 Home Screen - LG G5 Manual Tutorial Touch screen tips. LG G5 bring the world's first phone that's made for fun in bringing friends out to play.Transformative design featuring slide out battery and modular functionality. Here are some LG G5 Home Screen tips on how to navigate on your LG G5 smartphone. Drag – Touch and hold an item for a moment and then, without lifting your finger, move your finger on the screen until you reach the target position. You can drag items on the Home screen to reposition them. Double-tap – Double-tap to zoom on a webpage or a map (if the feature is supported by the application). Pinch-to-Zoom – Use your index finger and thumb in a pinching or spreading motion to zoom in or out when using the browser or maps, or when browsing pictures (if the feature is supported by the application). Rotate the screen – From many applications and menus, the screen orientation adjusts to the device's physical orientation. • Use the tip of your finger to tap the option you want. Be careful not to tap any other buttons. Shows the phone's status information, including the time, signal strength, batterystatus, and notification icons. Widgets are self-contained applications that can be accessed through the Apps screen or on the LG G5 Home screen. Unlike a shortcut, the Widget can function as anon-screen application. Tap an LG G5 icon (application, folder, etc.) to open and use it. Indicates which LG G5 Home screen canvas you are currently viewing. Provides one-touch access to the function in any Home screen canvas. Back Button Returns to the previous screen. Also closes pop-up items, such as menus, dialog boxes and the on-screen keyboard. Home Button Return to the LG G5 Home screen from any screen. Touch and hold to access the Google Now shortcut. Displays recently used applications. If you touch and hold this key, it opens a menu of available options. The operating system provides multiple LG G5 Home screen canvases to provide more space for adding icons, widgets and more. • Slide your finger left or right across the LG G5 Home screen to access additional canvases. You can customize your Home screen by adding apps and widgets and changing wallpapers. 2 Choose the Apps or Widgets tab and tap the desired item. 3 Drag it to the desired location and lift your fi nger. • While on the Home screen, touch and hold the icon you want to remove, then drag it to and release it. 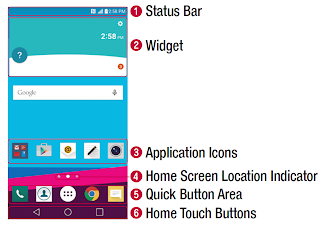 • From the Apps LG G5 screen or on the Home screen, touch and hold an application icon and drag it to the Quick Button area. Then release it in the desired location. Up to 6 apps can be added. • Touch and hold the desired Quick Button, drag it to , and release it. NOTE: The Apps Button cannot be removed. Touch and hold an application icon until it is unlocked from its current position, then release it. The editing icon will appear in the upper right corner of the application. Tap the application icon again and select the desired icon design and size. Tap OK to save the change. 1 Tap Recent App previews of recently used applications will be displayed. 2 Tap an app preview to open the application. Or tap back button to return to the LG G5 previous screen.